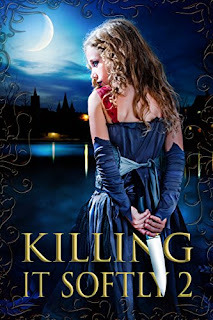 Barb Goffman’s Agatha award nominated short story, Evil Little Girl, originally published in 2013 has now been published again in the new anthology Killing It Softly 2: A Digital Horror Fiction Anthology of Short Stories (The Best by Women in Horror). 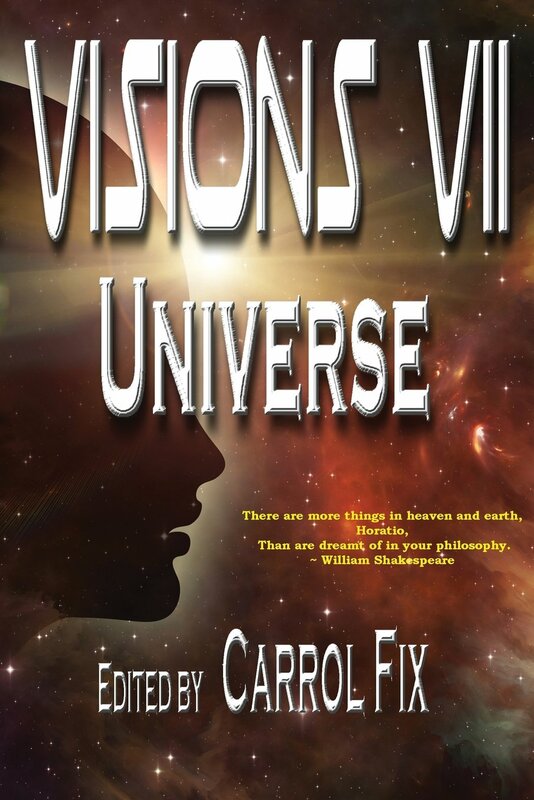 The eBook is available at Amazon and the print version should be out in the next couple of weeks. 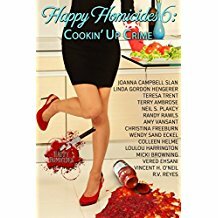 SMFS Member R. V. Reyes has a short story, Fish Fried, in the anthology, Happy Homicides 6: Cookin Up Crime. It is available at Amazon for ninety-nine cents until November 5th. 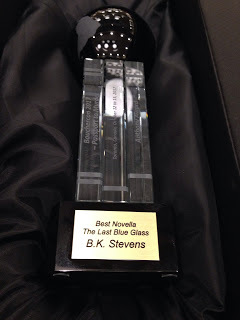 More info about the book and a related contest can be found at the author’s blog. SMFS Members Eve Fisher, Robert S. Levinson, Robert Lopresti, Susan Oleksiw, and B.K. 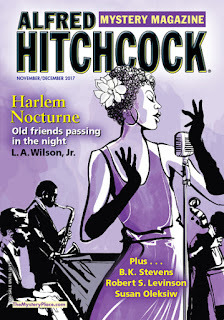 Stevens, were published in the latest issue of Alfred Hitchcock Mystery Magazine November/December 2017. Eve Fisher's story is "Darkness Visible." Robert S. Levinson’s story is "The House Across The Street." Robert Lopresti’s story is "The Chair Thief." 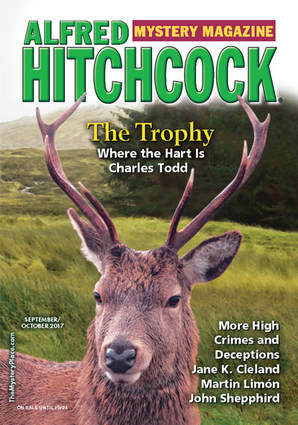 The issue is available from Dell Magazines, Amazon, and other vendors. 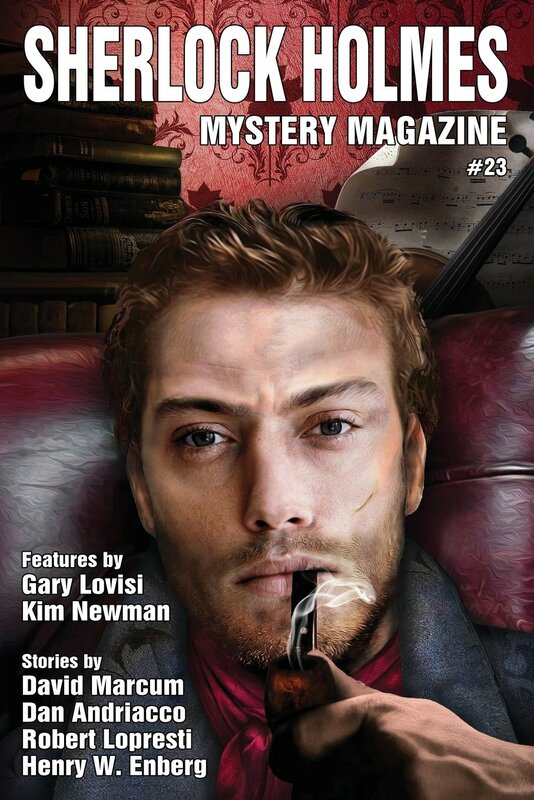 SMFS Members Stephen Liskow and Robert Lopresti were published in the latest issue of Sherlock Holmes Mystery Magazine Issue #23. Robert Lopresti’s story is The Cop Who Liked Gilbert and Sullivan.” Robert also has the distinction of having his name listed on the cover. The issue is available from Wildside Press, Amazon, and other vendors. The November/December issue of Ellery Queen is out, with, I'm proud to say, my name on the cover along with Charlaine Harris's and Doug Allyn's and my story, "Death Will Help You Imagine," inside, right after Bill Pronzini's. It's well worth the wait of almost 20 months from submission to print to be keeping such great company, especially since it was accepted way back in 2016 and I got paid for it shortly afterward. Member Michael Bracken sends in the two pictures below of members gathering before the lunch. 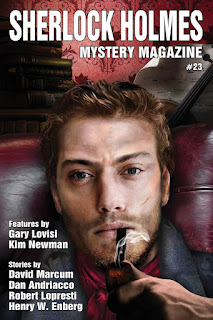 My crime-horror piece “Stegmann’s Basement” is free to read at Spelk Fiction. Storyline: After a botched robbery a young criminal flees into a creepy basement. For those not familiar with this market, Spelk is a popular U.K.-based site that accepts flash up to 500 words (all genres, literary). Non-paying, but seems to yield wide exposure, including via social media. In addition to his short story, Knight Vision, in the current issue of Flash Bang Mysteries, John is again in Woman's World. 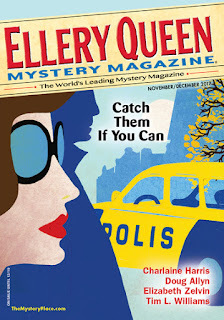 This time he has Charlotte in Charge is in the current (October 9) issue of Woman’s World. 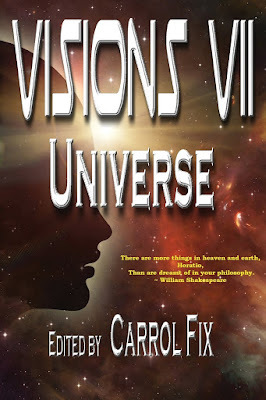 He also sends word that his short story Travelers is in the anthology Visions VII: Universe (Rogue Star Press). 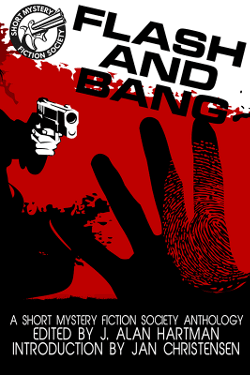 The latest issue of Flash Bang Mysteries is now up and features work from SMFS members.